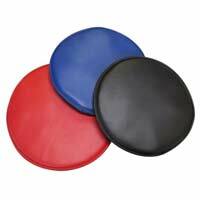 We offer round seat bar stool covers in 3 sizes. Our standard bar stool seat cover sizes come in a 14 inch, 15 inch, and 16 inch diameter. The skirt of the seat cover is about 6 inches. Each seat cover has a thin layer of foam sewn under the seat to provide added comfort. The bottom of the skirt has elastic so that the seat cover will stay in place. We typically stock black and red. We can do any color or any size with a little extra lead time. To figure out what size seat cover you need, measure the diameter of your bar stool seat and add an inch.